the decision which tutorial will be up is done. 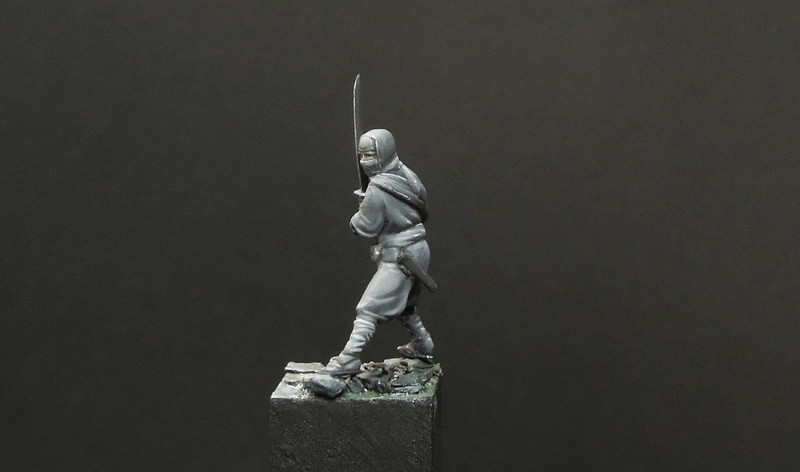 You voted for tiny Samurais instead of Zombies and here we go. Don't worry, there will be Zombies too in the future! The "year of the painter" on MV is rolling on and as it looks there won't be as much posts about other blabla all the time from my side. The posts that will appear from me will be more focused on sharing experiences, ideas and offering help. From painters to fellow painters. Still looking forward to find back to the roots of the jungle. Already feels awesome having tons of articles in the pipeline for our readers out there, but this already becomes some blabla again, let's get it on then. Musica. 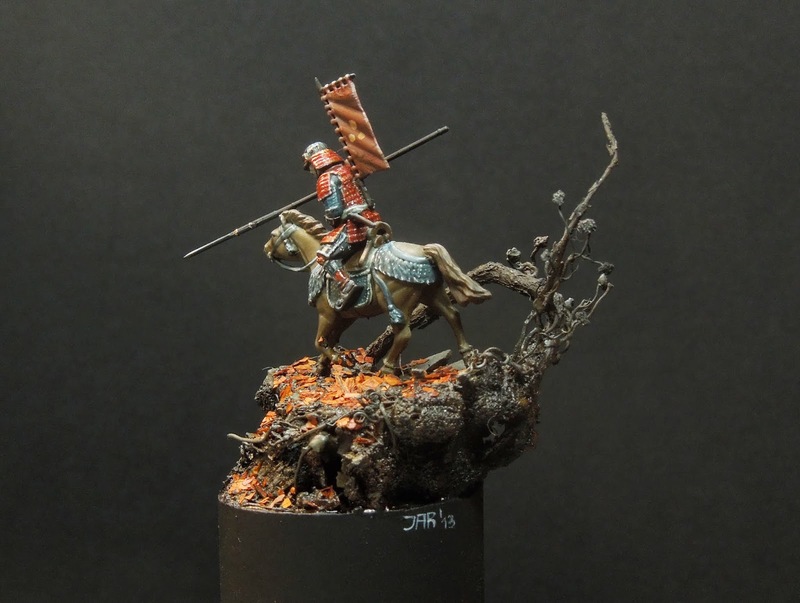 In the end of 2013 I had some weeks were I really was into painting 1:72 figures. Well, those are the models I am talking about, just for you to have them on your screen. 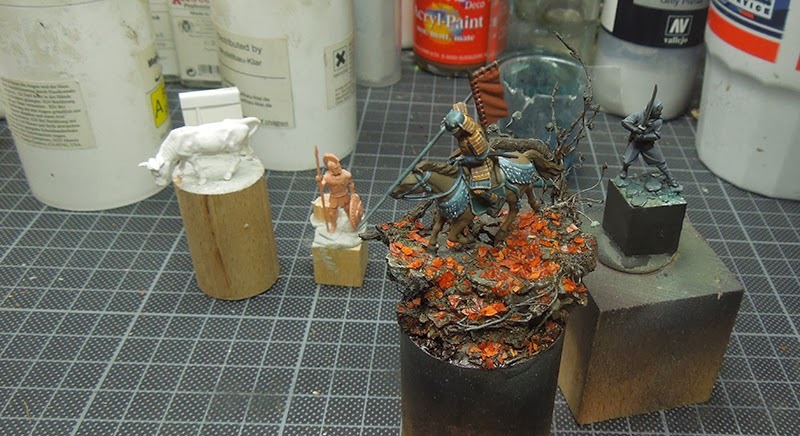 This tutorial will not show you a step by step guide with colour recipes, rather it will show you my progress and thoughts I have made during the work on the "Samurai on horseback" and the "Ninja". ... even with gaming bases!! 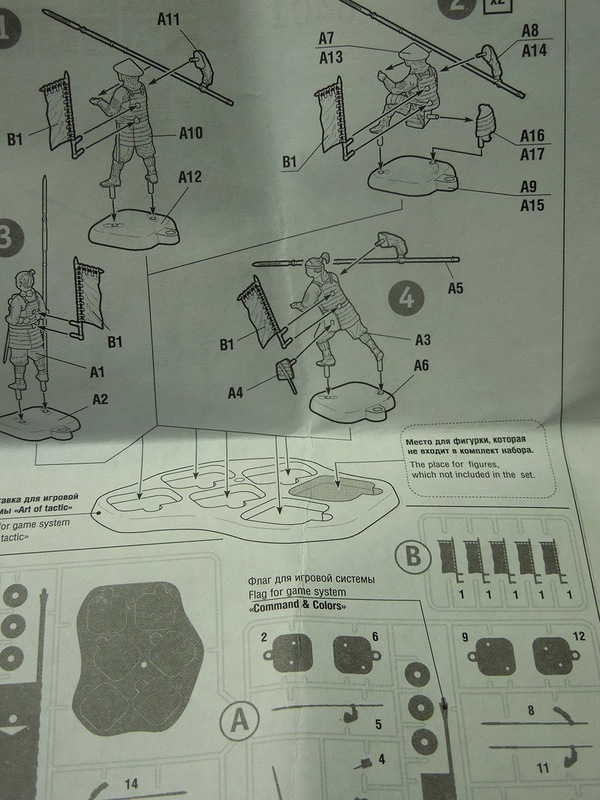 Ok this is very small and has to be prepared like every other plastic figure. This is madness ... no, this is Samurai!! Ok, then. 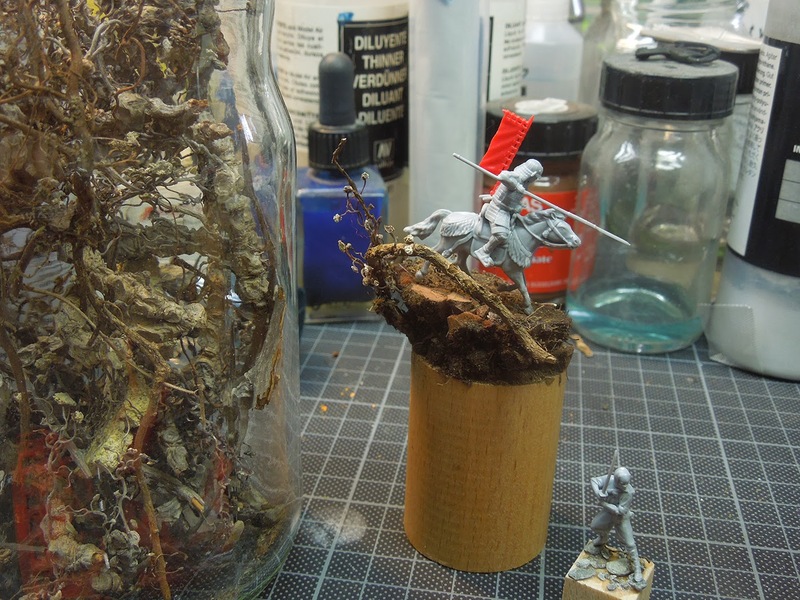 After preparing the plastic figures, removing all mould lines with a sharp scalpell it was time to build them up and find some proper plinths for them. 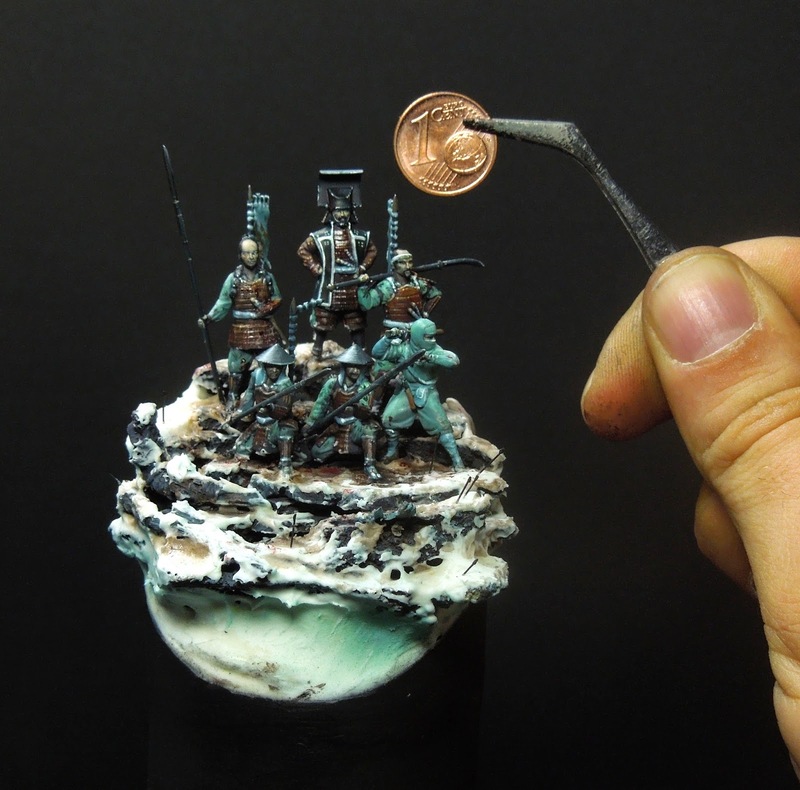 They also had to be very small, I really enjoyed this vacation from the usual scale I paint miniatures in. 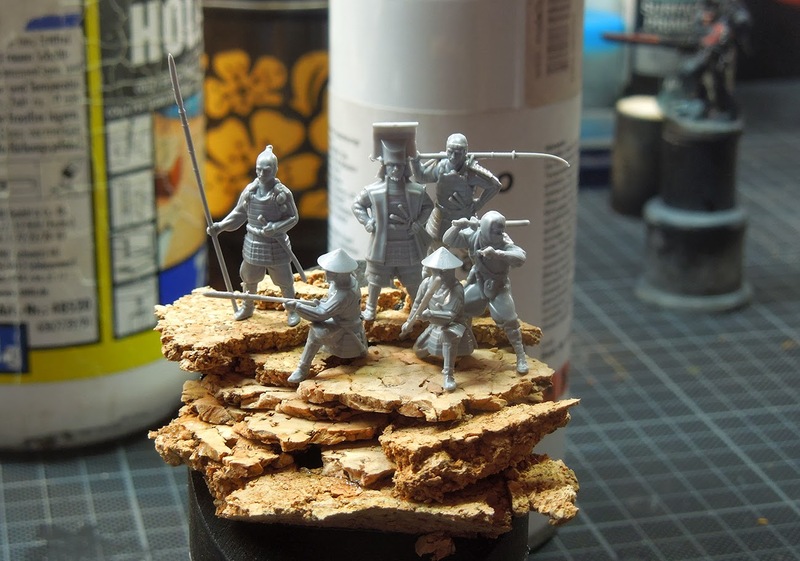 I decided to do simple but nice bases. 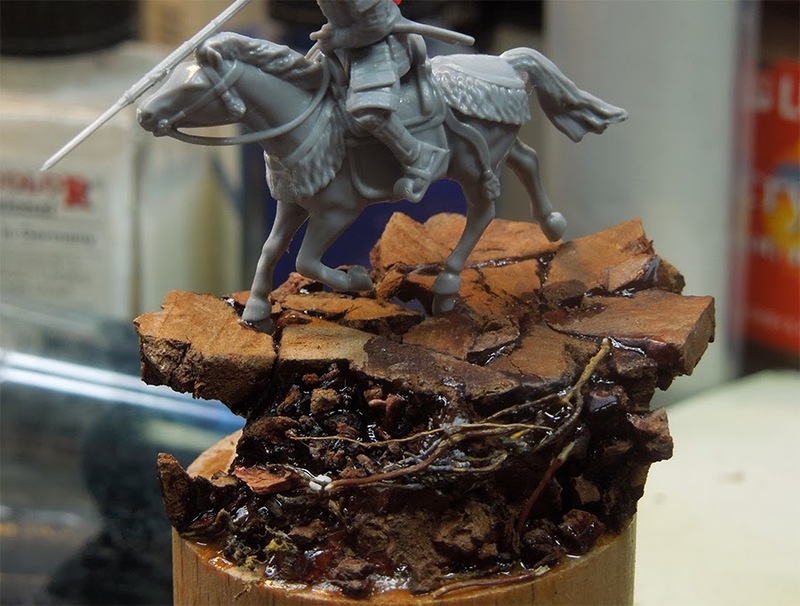 For the Samurai on horse I used a cool wood piece that I destroyed and glued in place, while for the Ninja some tiny stones were glued to tiny dice-sized plinth. 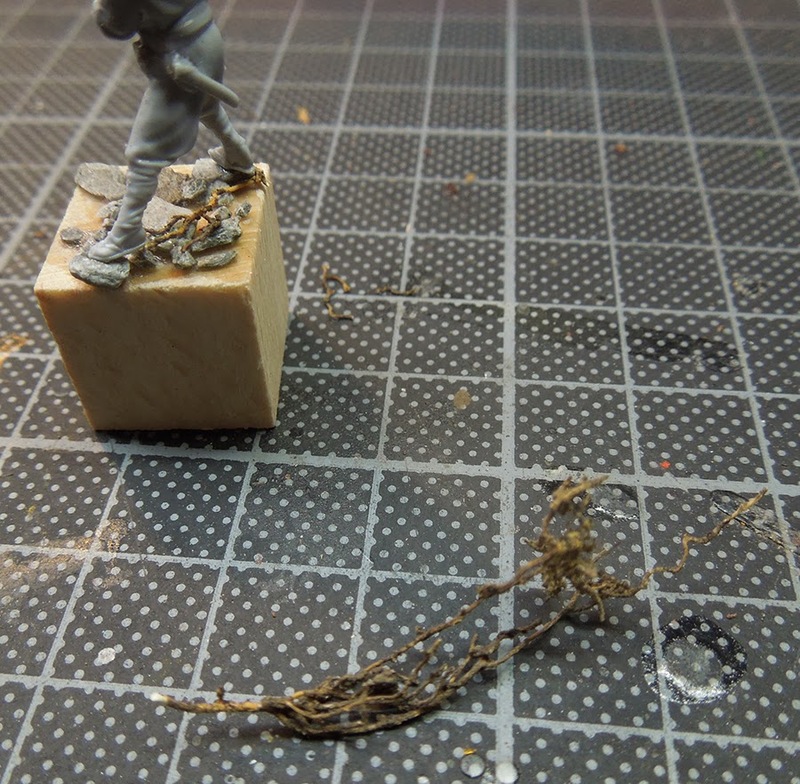 After the bases were prepared also with some soil/earth to make it all one natural piece the figures have been primed black. 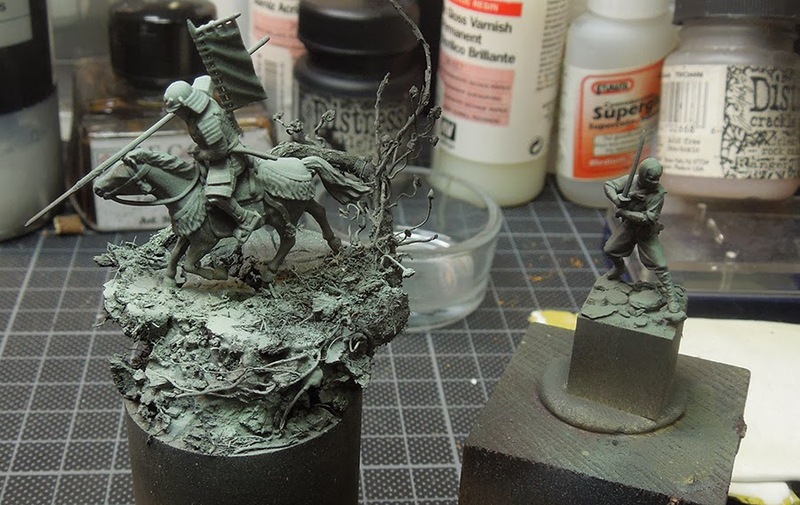 After this was dry I used the Airbrush and some bright greenish grey colour (I think it even was VMC Green Grey) to apply on the figures and get a better overview on what is happening there. 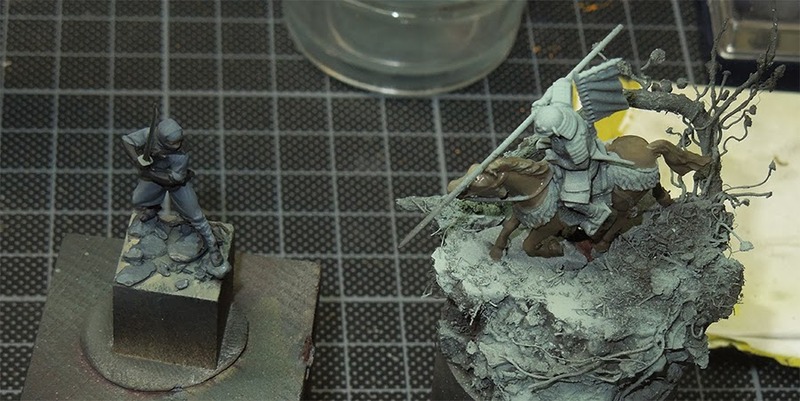 After this step I gently started to apply basic colours to both of the models. 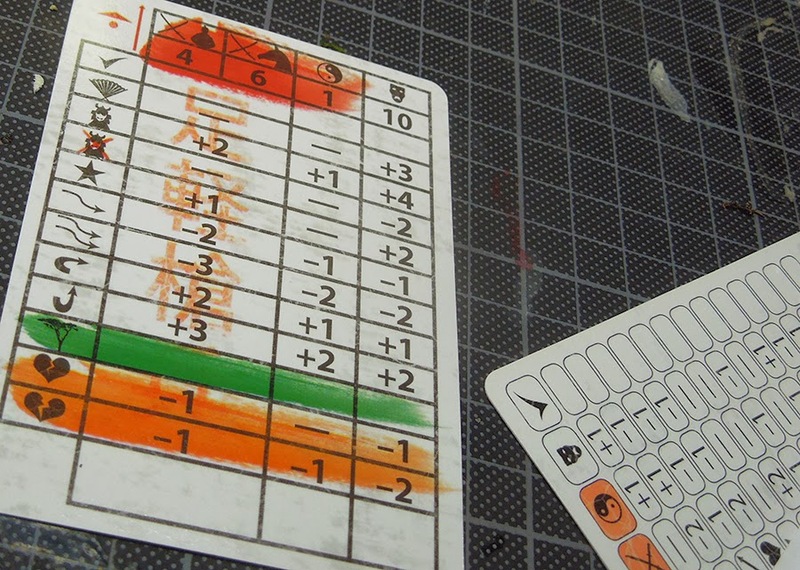 Basic colour means, I place an opaque colour. 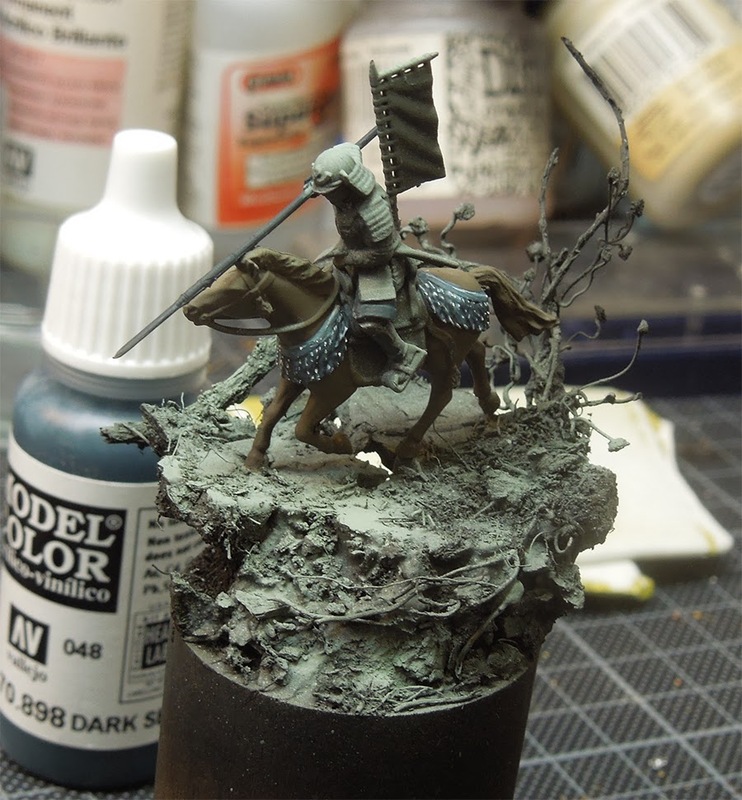 I want this colour to be the colour of the area in the end, still I have to paint shadows and lights to it later on. It doesn't matter in my eyes if such a little distraction happens as I know that there will be a base tone on every colour in the end. 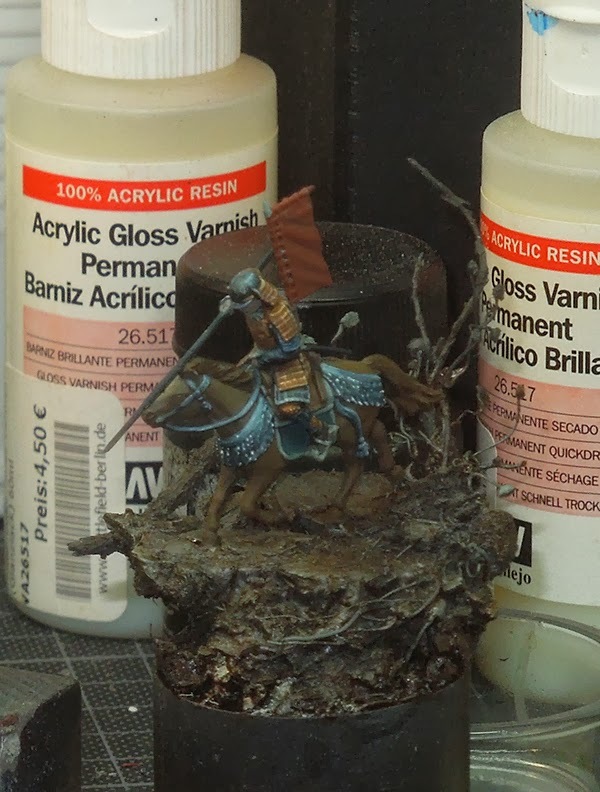 The base was painted by putting a wet basic tone of something brownish to the base and painting a sketch of light and shadow to it by mixing in colours from the pot to the wet area. At this point I do paint my plinths black. 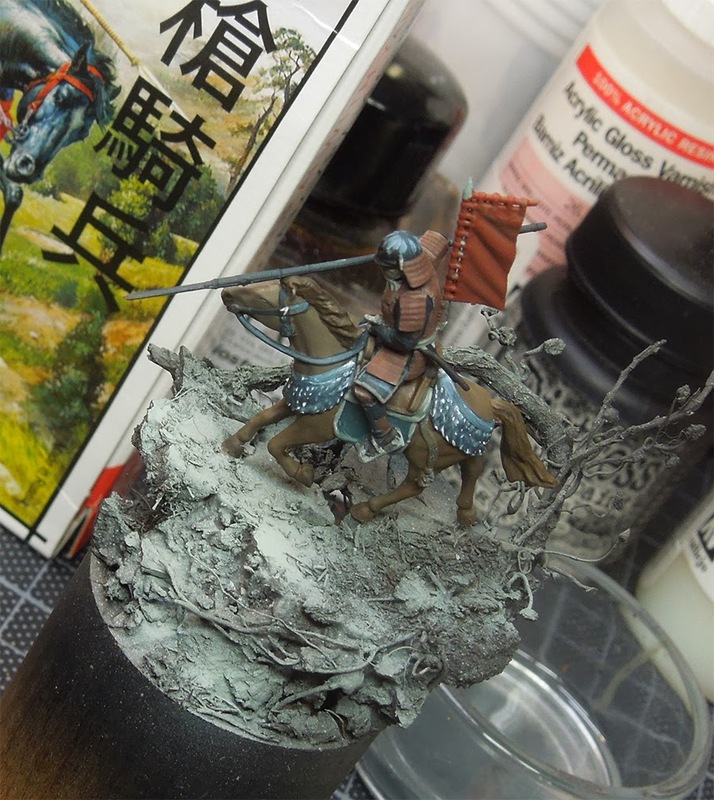 It was time to start what I have done to the blue parts on the horse to other areas. Working my way to highlights and shadows. 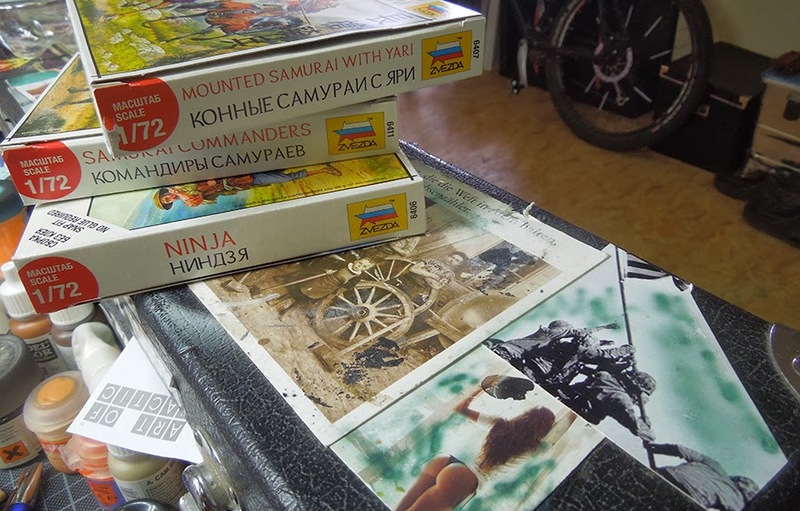 Also to the Ninja. Working on the highlights and shadows will help your eye to read the figure better as it will not only be a simple plain area of colour. It comes alive, even in 1:72. 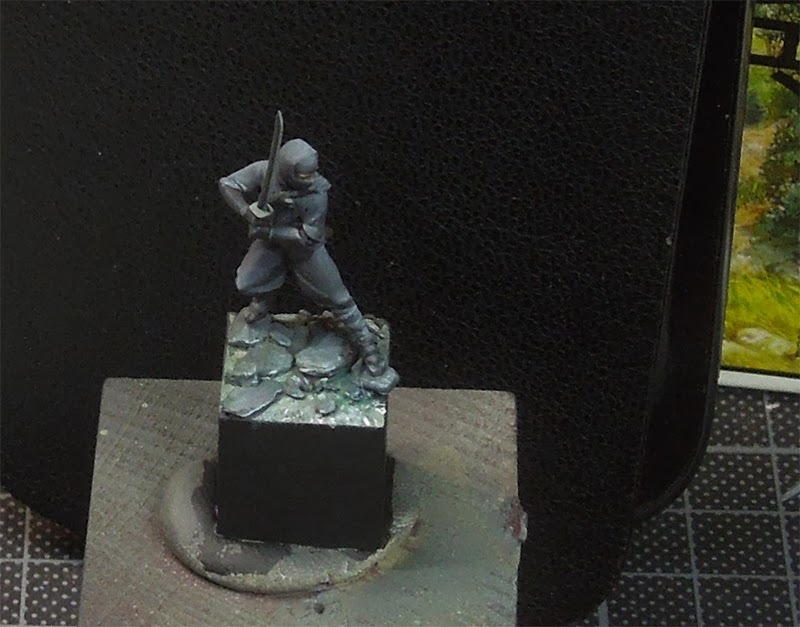 For the Ninjas base I decided to go for a little river with stones here so I added some gloss varnish to the greenish/grey stone area to make it look wet. 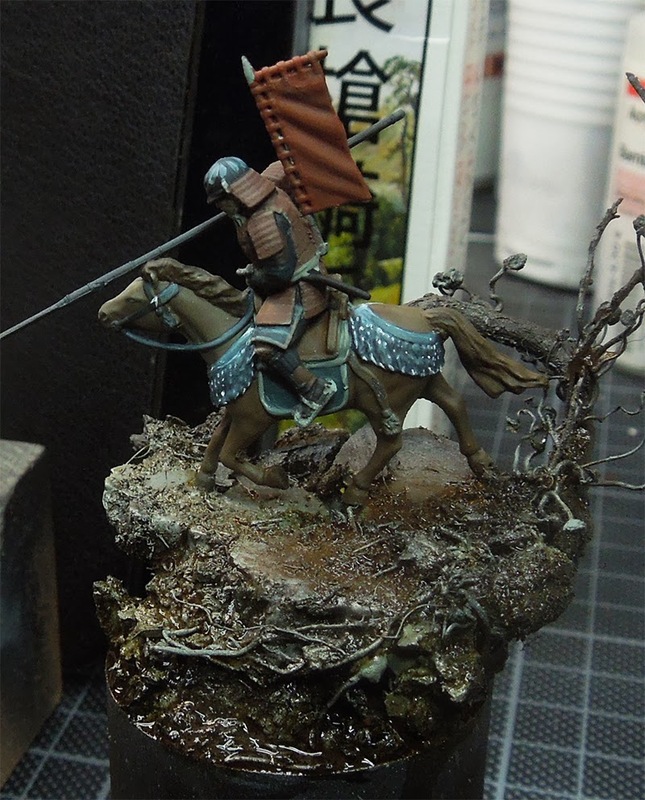 For the Samurai on horseback I went for an autumn base and used some natural leaves. I did use them as even there are other brands who offer great products most of them do not fit in this scale. By grinding them by myself I am able to decide how big they will be in the end. 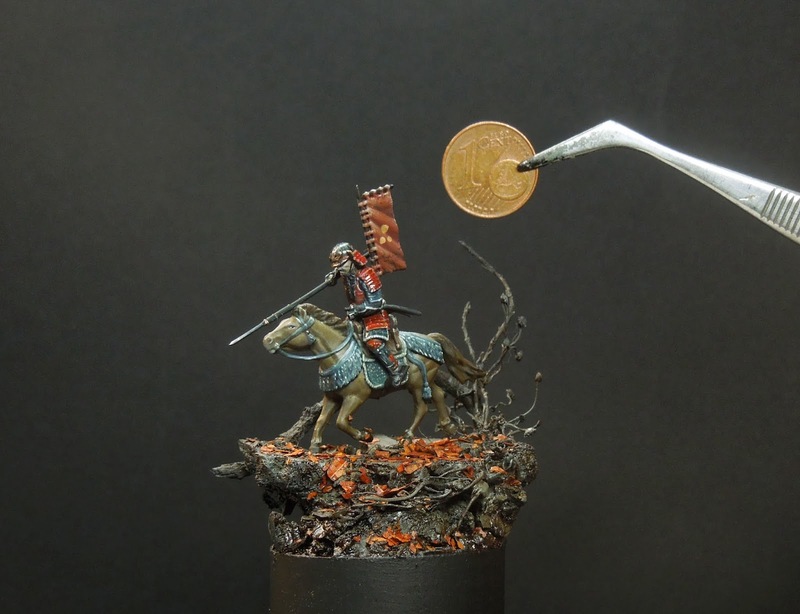 The leaves have been placed with matte varnish. thoughts on it in the near future. What I can say in retroperspective is that this Scale is not really different than others. You can work with the same techniques, same theory and can achieve cool results if you put proper time to your goals. 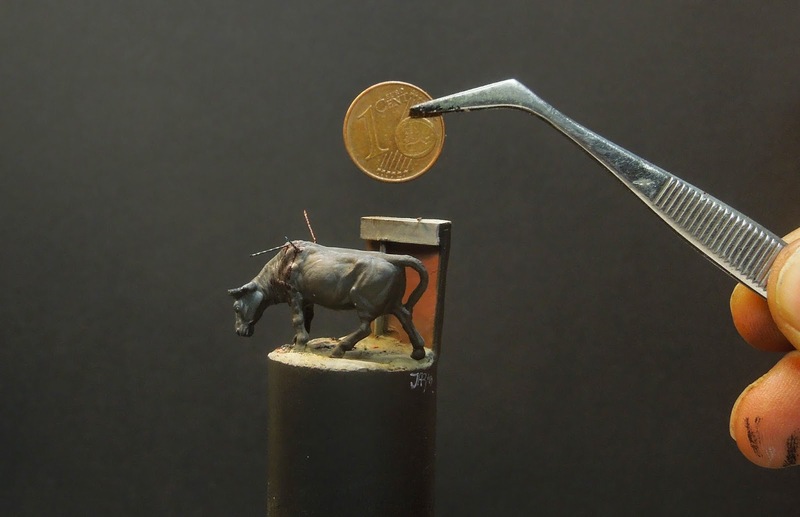 What I really enjoyed during my 1:72 weeks was that I became better and better in working with those ultrasmall details. It trained me to paint smaller dots and to do smaller glazing strokes with just the side of the tip of the brush. It was good to see how it improved by just painting it and I know that this will also help me on future projects, whatever scale they might have. 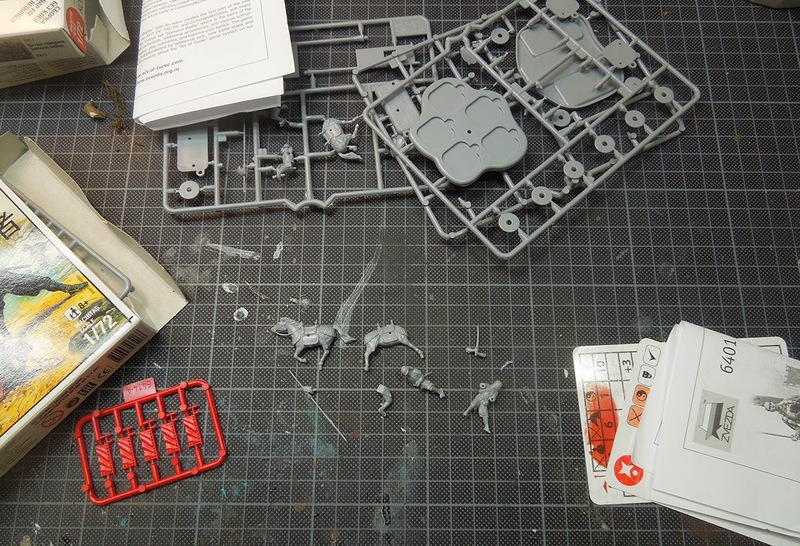 Well, that was my little journey through both of these models. I hope you enjoyed it? Very cool to see your thoughts on this, and how you went about it. Really nice walkthrough. Not so much the paints, etc, but the way you did it. Nice mate.. looking forward to seeing more of these in the future ( especially the zombie one.. selfish me I know, but still! ). Inspirational work, thank you for sharing. 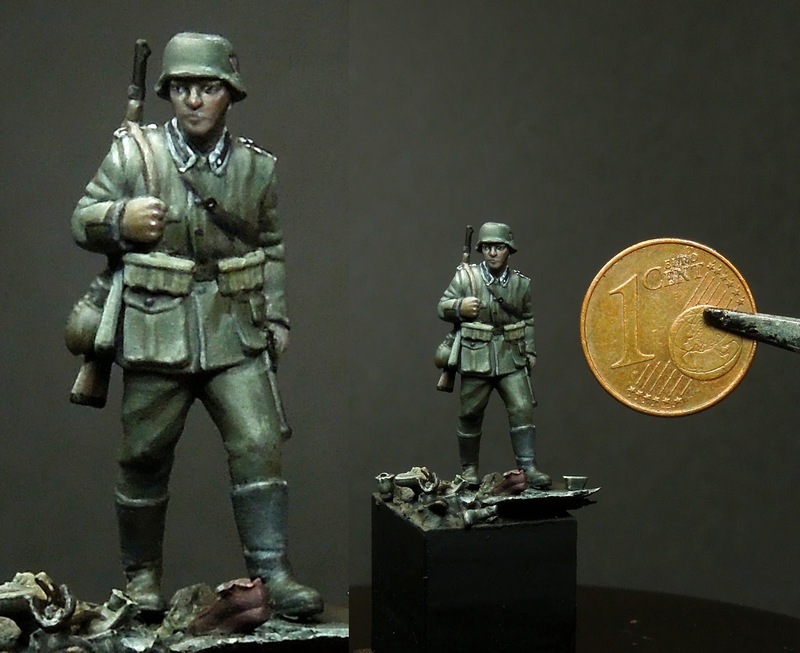 Painted like this 20mm is an excellent scale. It's interesting to see how you build up a figure,what you are thinking about and what great reasults you get. I'm new to painting figures and decided to learn the theory before actually painting. Thanks for your insight and guidance on the subject! 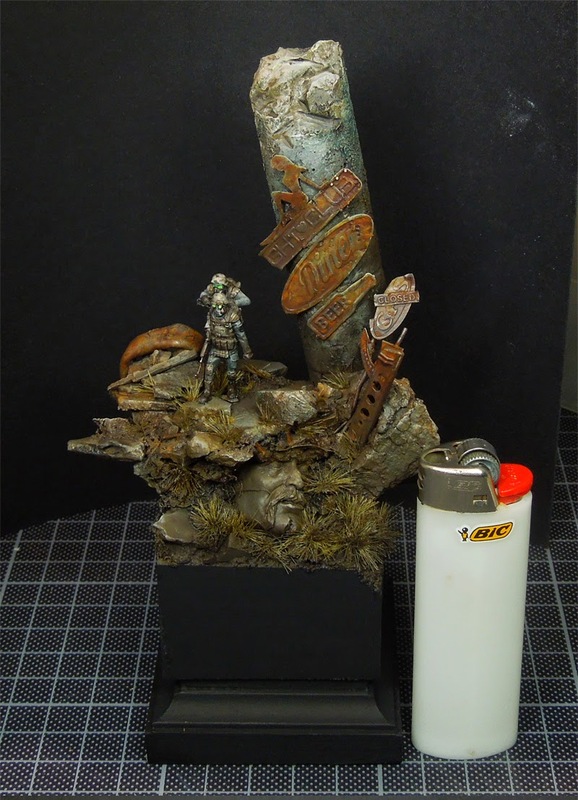 Your techniques and painting are just impressive! Saw a few figures painted online, but none as yours. 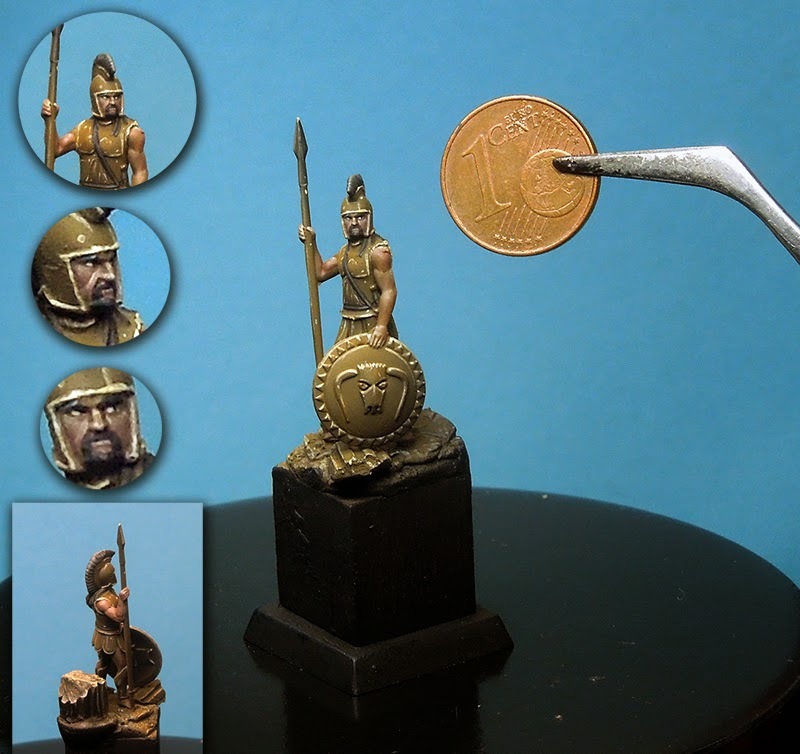 How do you manage to paint the faces with such detail? May I ask what brush you use? Thanks for your kind comment. 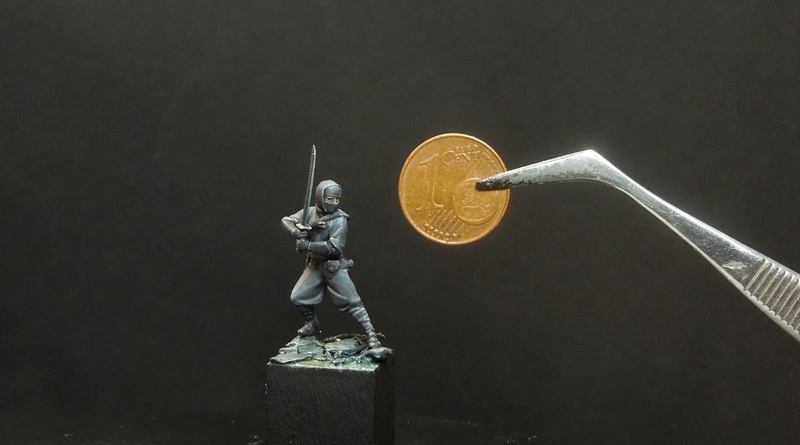 I am happy that this article can help you in your miniature painting progress and journey. Well, I am mainly painting everything with a Windsor & Newton Series 7, Size 1 brush. 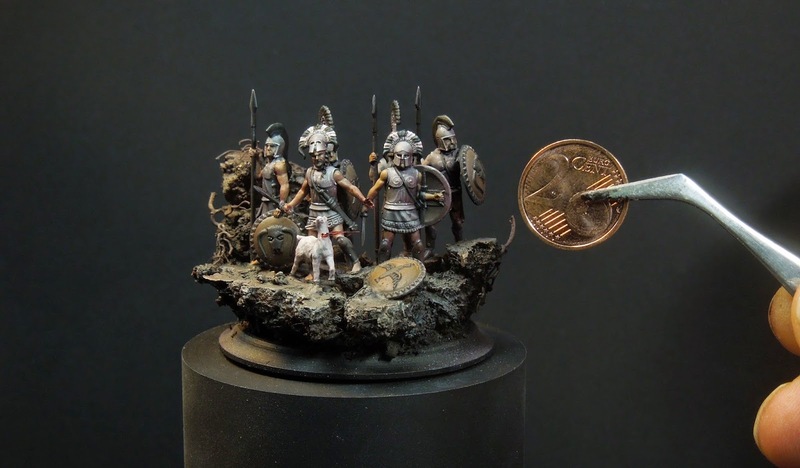 I am planning on rebasing the whole army (actually two copies) on Litko bases - any suggestion on what I should do with the pins on the bottom of the models feet? 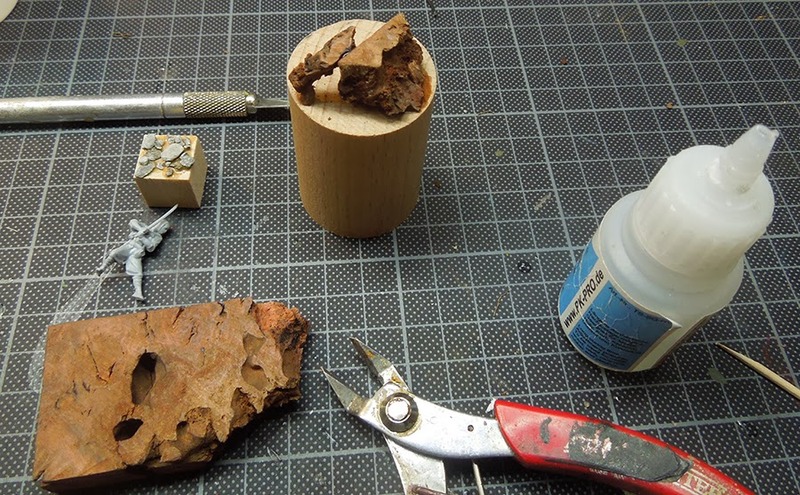 I can cut them off, or use the stock bases and a pin vise to put holes in the new bases. Hey Don, well I think you already answered this question on your own. You can do exactly like you said. 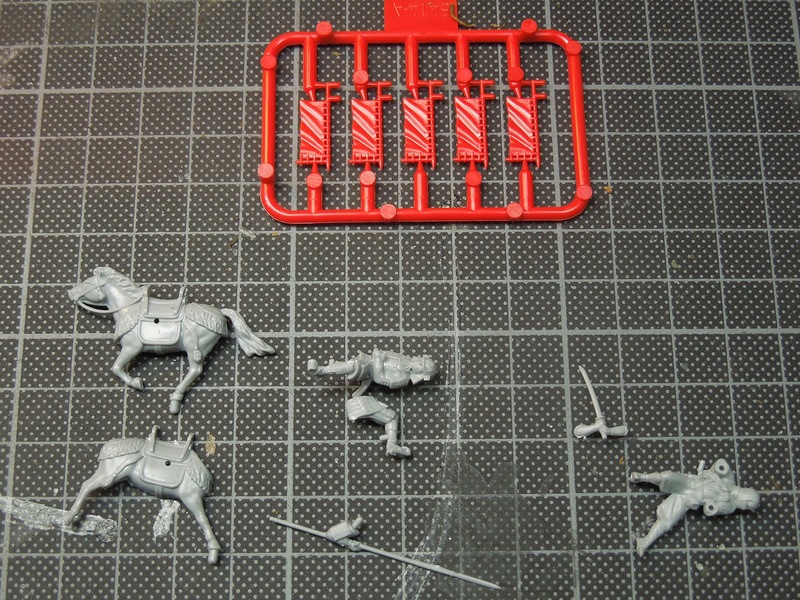 Cut them off and glue them to your bases or use the pins and put new holes to the new bases. So amazing! If I ever become this good, I will have "arrived"!